Few weeks later than originally expected but here it is – Castle Windsor 3.0 (along with its facilities and Castle.Core) achieved release candidate status. There is one major new feature in this release: registration API gained ability to specify properties to ignore/require. There are some scenarios where that’s useful, for example where integrating with some 3rd party framework that forces you to inherit from a base class which exposes its dependencies as properties. Creating pass-through constructors for each inherited class can be mundane. In those cases you can simply mark those base class properties as required, in which case Windsor will not allow them to be resolved unless all base property dependencies are satisfied. PropertyFilter enum supports several other most common scenarios, and for advanced cases there’s an overload that gives you more control. Full changelog is included in the packages. Please, if possible, take the time to upgrade to this version and if you find any issues report them so that the final release is rock solid. If no major issues are found, the final release will be published in two weeks. The binaries are available on Nuget right now, and soon on our website. Last year I found myself in a sudden and quick need to set up working environment for a team of four, and as I like Git very much, I wanted to use it as our VCS. The problem was, we weren’t allowed to use any third party provider, so GitHub was off the table. As I searched the Internet there were a few guides to set up team Git environment on Windows, but they all seemed very complicated and time consuming. For our modest needs we experimented a little and came up with a solution that was very simple, didn’t require any additional software to be installed anywhere and worked like a charm. Recently I used it again on my current engagement, and one of my colleagues suggested I should blog it, so here goes. The guide assumes you already have your local Git set up. For that, there are plenty of resources on the Internet, including my own blogpost about Windows Git tooling. The entire tricks works like this – expose folder containing your shared Git repository as Windows network share. There are two twists to the entire solution – one of them is – your shared repository needs to be initialized with –bare flag. Second step is to expose the folder with our newly created repository on the Windows share. You also use your standard Windows mechanisms to control and limit access to the folder (make sure you give the developers write access!). This step is perhaps not exactly necessary but I couldn’t get it to work otherwise, so here comes the second twist. 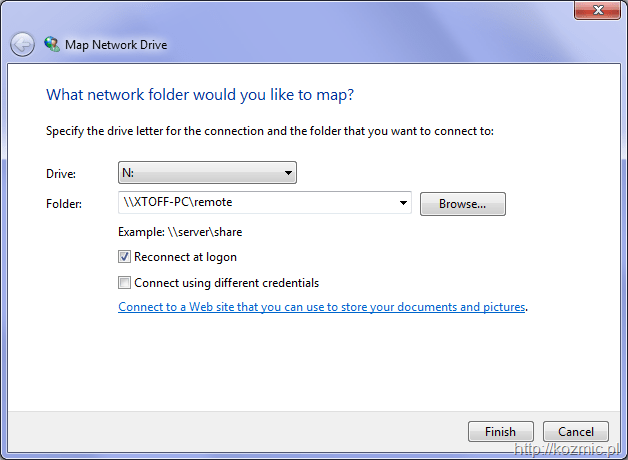 In order for your developers to be able to access the shared folder via Git they need to map it as network drive. Last step is the standard Git procedure – every developer on your team needs to add the repository sitting under their newly created network drive as remote. Notice the use of “file:///” prefix in front of the mapped drive name. That’s all. I hope you find it useful, and if you know a way to eliminate step three, let me know in the comments. I’m not getting into holy wars, and I’m not trying to convince anyone that Git is better than any other VCS. 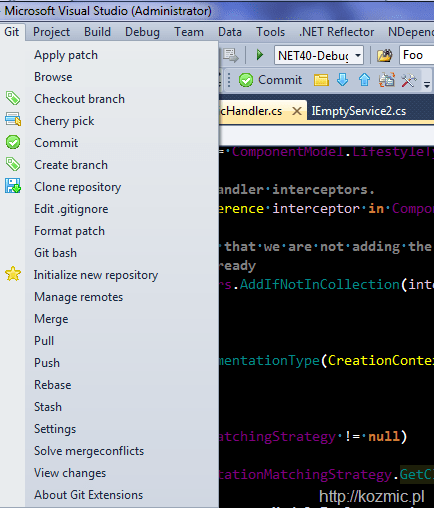 Instead I’ll walk you through the tooling I use to interact with Git on Windows, with Visual Studio. First thing you should be getting is Git Extensions. With that, similar to TortoiseX family of tools you get nice context menu that gives you access to most common operations quickly, via GUI, and with no need to memorize command line options if you want to avoid it. 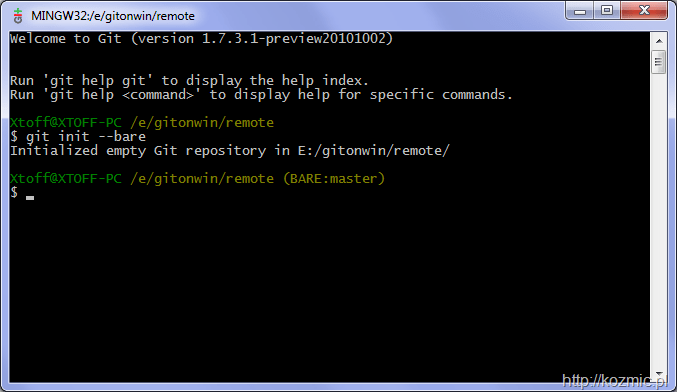 You can also launch Git command line in the selected folder and then all power of git is at your disposal. If you’re a .NET developer, you’ll want to work from within Visual Studio. 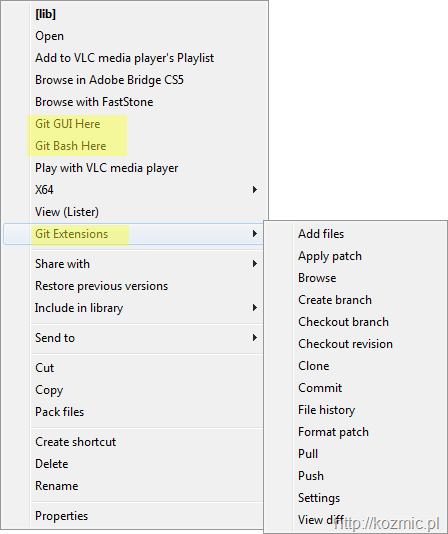 I’m sure you’ll be happy to learn that Git Extensions has a really nice Visual Studio integration as well. You get two things – a menu with all the options that Explorer context menu gives you and more, including ability to edit .gitignore file (also the tool will generate a new .gitignore file for you with Visual Studio specific rules!) and to launch a Git bash. Also you get a Git toolbar with most commonly used commands: Commit, browse, push, pull, stash and access to settings. The way I usually work with it, is I use Git bash for most operations. There’s one exception to that rule though – committing. I think Git Extensions’s Commit window is the best of all VCS I’ve worked with. It clearly separates files you want to commit (in your Index) and files you leave out for now. It clearly shows you status of each file (new, deleted, modified) with distinctive, large icons, also it shows you an on-the-fly diff of what changed in any given file, and it’s blazing fast. Mostly the readability benefits are why I stick to the UI for this operation. In addition to Git Extensions I use another tool called Git Source Control Provider which plugs into standard Visual Studio VCS provider mechanism to give me some additional functionality (you can get the tool via Visual Studio extension manager). Overlay icons showing you status of each file in Solution Explorer. 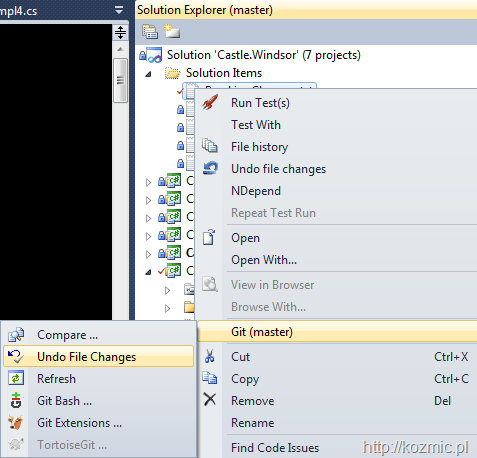 It shows you name of the current branch in the Solution Explorer bar at the top (see “(master)” on the screenshot below), and you will work a lot with branches in Git. It gives some additional options in the context menu. This (plus command line) makes the job very, very simple and quick, and that’s what I stick to on my machine. There’s one more thing that makes working with Git a pleasure (especially if you’re working on a team that’s not completely co-located). I love Github. It has a very clean, simple interface that makes going through project history, diffing commits and code reviews a very simple and frictionless process. Yes, perhaps those tools lack some eye candy that other tools have but frankly – I don’t care, and neither should you. They are more than enough to let you quickly do whatever you need to do with your code and don’t stand in your way. And that’s what a good VCS and tooling around it should be – something you don’t really have to think about and you can rely on to keep track of what is happening with your code with confidence. And that’s precisely what Git is – so if you’ve been held back, go ahead, install those tools and give Git a shot – you won’t look back. Exactly one month after release 2.5.0 we released first minor update to this release for Windsor and Castle.Core. It contains some minor improvements and fixes for issues that were identified after the 2.5 release. 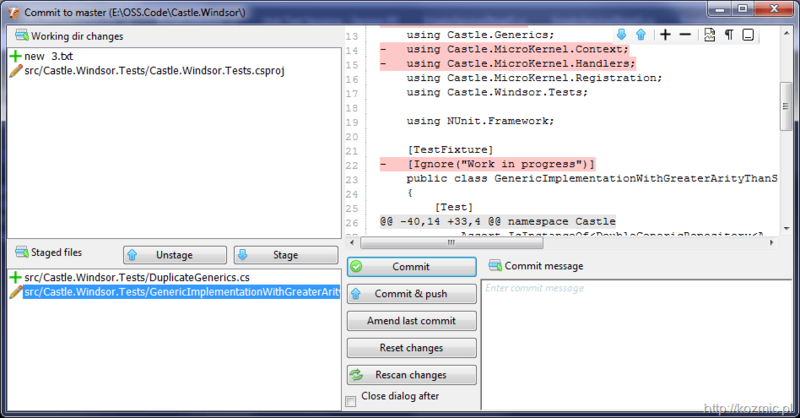 Complete changelog for Windsor contains 20 items, and 9 for Castle.Core, including single breaking change, which is deletion of web logger so that Castle.Core has no dependency on System.Web and we no longer need to provide two versions for .NET 4 (one with Client profile support, and one with full profile). This lets you detect situations where you have a singleton component that depends on a transient or per-web-request component, which is usually a bug (although there are rare cases when singleton depending on transient is a valid solution). 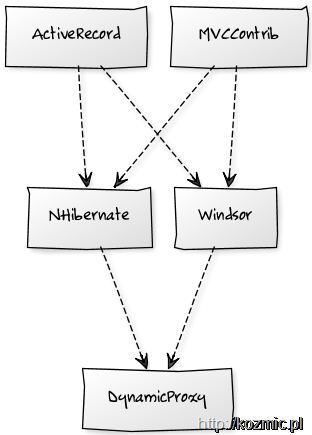 Notice that this is only a helper and due to dynamic nature of Windsor it can only detect a statically known subset of possible dependencies. As such you should not assume that if the feature does not detect any issues there aren’t any. A bit later than expected (ah, work) I published beta 2 of Windsor 2.5 today. The release has the following changes as compared to beta 1. Silverlight version (for Silverlight 3 and Silverlight 4) is now included in the package. – indexers on IKernel are now obsolete. – BREAKING CHANGE: Restructured lifecycle concerns – introduced ICommissionConcern and IDecommissionConcern and favors them over old enum driven style. – Fixed how contextual arguments are handled. Null is no longer considered a valid value (That would cause an exception later on, now it’s ignored). – Changed method DeferredStart on StartableFacility. It now does not take a bool parameter. A DeferredTryStart() method was introduced instead. This is probably the last pre-release for 2.5 and if no critical issues are found, we’ll release final release in 2, 3 weeks. Go grab the bits, see if it works for you and if it does not report back. I’m also looking for people who want to contribute sample applications for the final release. Ping me if you’d like to contribute to that. 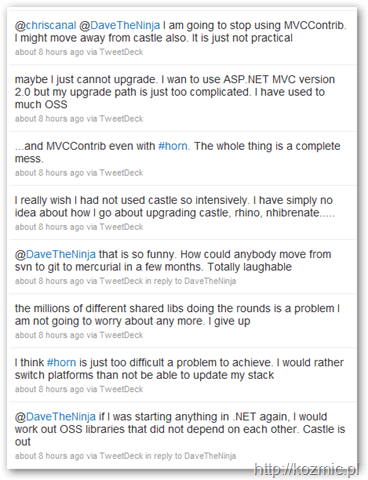 Paul, whom some of you may know as the maintainer of Horn project, left a comment on my blog, that was (or to be more precise – I think it was) a continuation of series of his tweets about his dissatisfaction with the state of affairs when it comes to dependencies between various OSS projects in .NET space, and within Castle Project in particular. I must say I understand Paul, and he’s got some valid points there, so let’s see what can be done about it. Offering a set of tools (working together or independently) and integration with others open source projects, Castle helps you get more done with less code and in less time. How do you achieve modularity. Say you have two projects, Foo and Bar that you want to integrate. You could just reference one from the other. This however means that whenever you use Foo, you have to drag Bar with you. 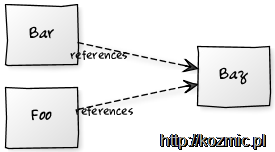 For example, whenever you want to use MonoRail, you’d need to drag ActiveRecord with it, along with entire set of its dependencies, and their dependencies, etc. Instead you employ Dependency Inversion (do not confuse with Dependency Injection). You make your components depend on abstractions, not the implementation. This however means, that in .NET assembly model, you need to introduce third assembly to keep the abstractions in. Now we have 3 assemblies instead of 2 to integrate two projects. Within Castle itself common abstractions are being kept in Castle.Core.dll. But what if we want to take more direct advantage of one project in another project still maintaining the decoupled structure? We need to extract the functionality bridging the two projects to yet another assembly. Tick – now we have 4 of them. In this case the FooBar project would be something like ActiveRecord integration facility, which integrates ActiveRecord with Windsor. When you mix multiple projects together you enter another problem – versioning. Now, once a new version of one of the projects is released, you either have to wait for all the other projects to update their dependency to the latest version, do it yourself (possibly with some help from Horn), or stick to the old version. The situation gets even more complicated when there were some breaking changes introduced, in which case plain recompilation will not do – some actual code would need to be written to compensate for that. These are the main issues with this model, let’s now look at possible solutions. First thing that comes to mind – if having some assemblies means you’ll need even more assemblies, perhaps you should try to minimize that number? This has already come to our minds. With last wave of releases we performed some integration of projects. EmailSender got integrated into Core, one less assembly. Logging adapters for log4net and nlog were merged into core project, which means they still are separate assemblies (as they bridge Castle with 3rd party projects) but they’re now synced with Core and are released with it, which means this is one less element in your versioning matrix for you to worry about. Similar thing happened with Logging Facility, which now is versioned and released with Windsor itself. For the next major version, there are suggestions to take this one step further. Merge DynamicProxy with DictionaryAdapter and (parts of) Core into a single assembly; Merge Windsor and MicroKernel (and other parts of Core) into an other assembly. With that you get from 5 assemblies to 2. That reduces Castle’s internal dependencies, but what about other projects that depend on it? After the recent release, we started a log of breaking changes, along with brief explanation and suggested upgrade paths, to make it easier for applications and frameworks to upgrade. We have yet to see how this plays out. This is the actual question to you? What do you think can be done, for Castle specifically, but more broadly – for entire .NET OSS ecosystems to make problems Paul mentioned go away, or at least make them easier to sort out? Once in a while I talk to someone who sais something like this: “I love open source, especially project X – I would love to contribute back, but I don’t know how”. There are different variations. “I am not a programmer”, “I don’t understand the code – it’s so vast”, “I wouldn’t know how to submit these patch-things they ask for” etc. To help these people I decided to create a small (seriously – 3 posts, excluding this one) series about contributing to open source projects. I hope this will help more people get involved as they realize how much they can help with little effort. This should cover most of the ground to get people started. The topic itself is certainly much broader, and one could write a whole book about it, but why waste time for that, when there’s some great open source waiting for your contribution!